Solidarity Occupational Guilds launched its occupational guilds for the Arts today. “This Guild will consist of a community of artists who stand together and work together to protect artists against the bullying and manipulation in this industry. 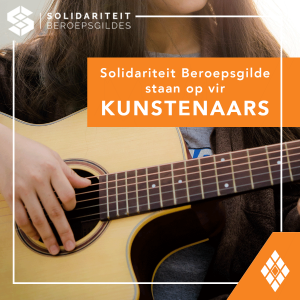 Our artists must not in any way be limited, otherwise their creativity will be limited,” Hennie Bierman, Head: Occupational Guilds at Solidarity, said. This follow after MultiChoice, sponsor of the Ghoema Music Awards, demanded that the nomination of the song “Die Land” be withdrawn from the 2019 awards. According to Bierman, the withdrawal of the song from the Ghoemas, has an influence on much more than only the artists. “The results of this decision are wide-spread and so many people’s freedom to creativity has been taken away, including producers and production teams,” Bierman said. The Occupational Guild for the Arts started with a campaign today against bullies who limit artists’ freedom. The campaign challenges the public to watch “Die Land” as many times on social media as the number of people who will watch the Ghoemas on television. “Approximately 150 000 watch the Ghoemas and we want to encourage the public to choose “Die Land” as the community’s choice by watching it 200 000 times on social media,” Bierman concluded. The Solidarity Occupational Guild for the Arts call on every artist to show their support for this matter by joining the Guild so that we can work together to strengthen each other.